This post was first published on 5thJune 2012 but I’m reposting it now as an accompanying piece to my AC/DC: The shock of WHO funding. Not much has changed, as you will see. Michael Day posed the question ‘Who’s funding WHO?’ as the title to a piece he wrote in the BMJ five years ago. Then, Day was reporting on a relatively modest sum of money ($10,000) finding its way to the World Health Organisation (WHO) from the pharmaceutical company GlaxoSmithKline (GSK) via a third party charity. I pose it now not because I have a new scandal to report, but to draw your attention to two documents circulated as background reading for the just- concluded World Health Assembly – documents enticingly titled A65/29 Add.1 and A65/30. These documents tell you how much money the WHO received during 2010-2011, and from whom. They were also the subject of a bit of a spat last year in the magazine Foreign Affairs between Sonia Shah and Christy Feig. So, I approach a summary of the data with some caution. As Susan Strange once warned: Cave! Hic dragones! You might think that the WHO is a wholly publicly funded organization. As an inter-national organization, you might imagine that its 194 member states give it the money it needs to do its job properly. You might also expect that WHO would be free do what it wanted with that money: afterall, WHO has health experts a-plenty, has a strategic plan, knows what the world’s health priorities are. So it should be trusted to do what it thinks best with its donations, right? Wrong. from member states and non-government funders such as foundations, investment banks, multi-national corporations, and non-government organisations. Assessed contributions (AC) are wholly flexible, they are agreed in advance and are thus predictable. This makes it easier for the WHO to plan what it wants to do with the money. Voluntary contributions (VC) are, well, voluntary. They don’t have the same predictability as ACs (although there are no guarantees even with ACs, as Italy’s recent shortfall in funding attests) and so make it di cult for the WHO to plan a realistic budget. Furthermore, only a tiny percentage of VCs are wholly flexible, meaning that the WHO is not free to do as it pleases with that portion of its money. For the two-year period 2010-11, US$ 944 million (20%) was AC; US$ 3600 million (80%) was VC. I was genuinely surprised to see who is funding WHO. First up, it gets a lot, I mean a LOT, of money from private foundations. At least 38 foundations provide 18% of WHO’s VC funding, according to one estimate. Just one foundation, the Bill and Melinda Gates Foundation (yes Bill Gates, the man who gave the world Microsoft and his wife) donated most of that – slightly more than $446m in fact. That’s more than any other donor except the United States and 24 times more money than Brazil, Russia, India, China and South Africa combined (the so-called newly-emerging economies). As with other voluntary contributions, BMGF doesn’t just give its money to the WHO and say ‘here’s our donation, do what you like with it’. No, its voluntary contribution is “specified”, i.e. it can only be spent on specific things decided by Bill and Melinda (and they really do decide themselves – their Foundation is very hierarchical). A Robin Hood tax for health? What about private industry – pharmaceutical companies for example? Do they fund WHO too? Pharmaceutical companies mostly contribute Schedule 5 ‘in- kind or in-service’ VCs, donating drugs rather than cash. For example, GSK donated almost $80m under this category for the two year period. But they also contribute to Schedule 2 VCs too. Not much, peanuts in fact, but just reading down the list I can see all the big names: Bayer ($1.12m), Bristol-Myers Squib ($1.2m), Eli Lilly ($2.9m), GlaxoSmithKline ($1.3m), Novartis ($1m), Johnson and Johnson, Merck, Novartis, Pfizer, Sanofi-Aventis, etc. What’s that? $10m in total? I would get out of bed for less, but not much less. You might well be thinking that, given the huge revenues that pharmaceutical companies command, they should be compelled to contribute much more to the WHO than they do – in cash, as Assessed Contributions, and with no strings attached. A Robin Hood tax for health on pharma profits, anyone? There are a couple of issues here. First, some of the donors listed above have done things (and continue to do things) that have detrimental consequences to our health. I’ve already blogged about Novartis’ attack on the generics industry in India, and there are too many cases of pharmaceutical malpractice to mention – but consider Johnson and Johnson’s $1.2 billion fine in April 2012 for seeking to conceal the dangers associated with an antipsychotic drug, or GSK’s January 2012 400,000 pesos fine in Argentina for clinical trial malpractice, or Eli Lilly’s $1.415 billion fine in January 2009 for promoting its drug Zyprexa for uses not approved by the Food and Drug Administration (FDA), or Pfizer’s $2.3 billion fine in Sept 2009 for illegally promoting its Bextra painkiller and other drugs. Second, it’s not who you are but who you also fund that matters. 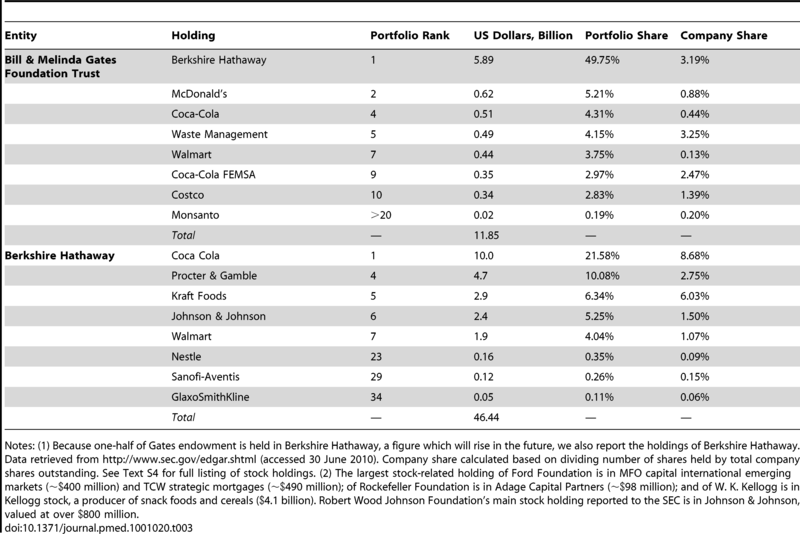 If we go back to the Gates Foundation for a minute, an eye-opening study in 2011 summarised BMGF’s stock portfolio. Remember, BMGF is the second biggest single donor to the WHO after the United States and yet, here it is, investing heavily in the likes of Coca Cola, McDonald’s, Kraft, Nestle – manufacturers of notoriously calorific products, and pariahs in the eyes of many public health activists. The WHO knows that the world is getting heavier – it says so in its 2012 World Health Statistics Report – so you can see why civil society groups are crying foul over WHO’s unashamed delight at receiving fat wadges of Gates’ cash. Spending time navigating your way around the budgets of health organisations may not be a high priority for most, but it is important. 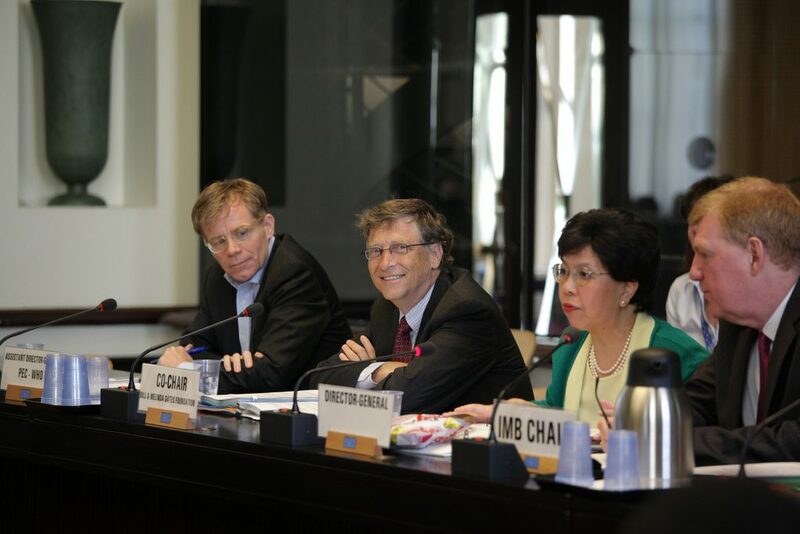 It is particularly important to understand the budget of the World Health Organisation, and to appreciate just how little funding that organisation receives. The WHO needs more Assessed Contributions if it is going to do what it does effectively and in the public interest. Voluntary Contributions are preventing the Organisation from doing its job, and it is becoming more vulnerable to the temptation of private financing. Fortunately, the WHO is also one of the very few remaining politically accountable international health organisations, which means we/you can put pressure on your elected officials to change the way they support it. Next Post Honey, I’ve married a psychopath! The perils of partnership.